Players and match officials were stunned to see a flare attached to a parachute landed on the pitch during Thursday's Europa League match between Fenerbahçe and BATE Borisov. The Europa League round of 32 tie should have been devoid of atmosphere after Fenerbahçe were punished by UEFA as a result of fans throwing fireworks on the pitch during a previous European game against Borussia Mönchengladbach in December. Yet even with the stands empty, the Turkish fans still managed to land flares on the pitch during the game. 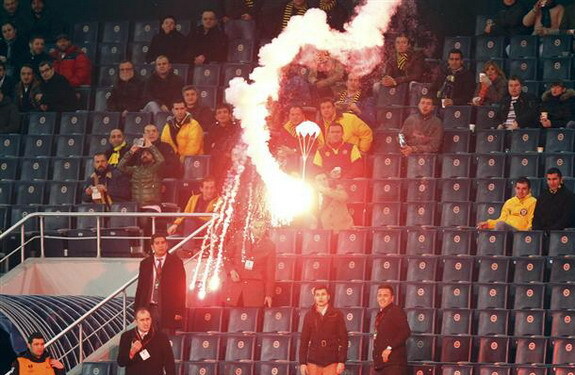 Five people were detained on suspicion of launching the flares into the ground. "Those who sent these flares must be idiots," said UEFA observer Stefano Farina, adding that the incendiary devices resulted in the burning of the Turkish flag and a fine against the team. Despite the incidents and the lack of crowd support, the Yellow Canaries managed to see off the Belarusian challenge with a 1-0 victory.